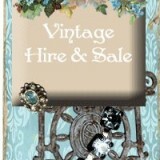 Hire Love Vintage Rentals is Perth’s own Vintage Prop and accessory hire firm. You can hire unique, bespoke and hard to find pieces for your D.I.Y wedding or event at an affordable price. We dont have huge numbers and no minimum hire, but rather, a unique collection of items that can be styled together for great effect., making your event truly unique and one to remember. Too much on your plate with planning your wedding or event? ……need a hand? We are happy to co-ordinate your day and make sure your theme comes together perfectly and your day runs smoothly. Located in Mount Lawley, pick up is available a minimum of 24hours prior to your event or we can arrange delivery throughout the Perth Metro Area. Please contact us with your individual requests.